It's Not Too Late - Claiming Crown 2008 Nominations Due Frday, April 25! The tenth renewal of the rich and prestigious Claiming Crown will be held on Saturday, August 2 at Canterbury Park in Shakopee, Minnesota. The deadline for regular and open nominations for Claiming Crown 2008 is Friday, April 25. The event is limited to horses that have started at least once since January 1, 2007 for a claiming price ranging from $7,500 to $35,000. 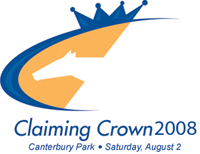 The Claiming Crown is returning to Canterbury Park, where seven of the previous nine renewals of the event have been heldThe exceptions were last year, when the event was held at Ellis Park in Henderson, Kentucky, and the 2002 renewal, which was held at Phildelphia Park in Pennsylvania. The seven-race event will boast guaranteed purses of $600,000 to qualifying claiming horses from around the country. Often referred to as the "Breeders' Cup for Claiming Horses," the Claiming Crown offers claiming horses that have run for various claiming prices over the course of the previous year to compete for rich purses and prestige. The event offers seven races with purses ranging from $50,000 to $150,000 on both turf and dirt. This year's races are:. The Regular ($100) and Open ($250) nominations deadline is Friday, April 25. Open nominations hold a spot without identifying a specific horse until the Friday, June 13 identification deadline. Also on June 13, nominations ($500) close, while supplemental nominations (5% of purse) close on Friday, July 18. For more information and nomination forms, click here to visit the Claiming Crown website or call Claiming Crown Coordinator Nat Wess at (800) 340-6361, ext. 6411.